I read thousands of words everyday about gout. The complexities are endless, whether you look at causes, diagnosis, or treatment. I’m reminded of the best piece of advice I learned in the complex world of business, finance, and Information Technology. Gout is complicated. Fixing gout is simple. Do not start with the herbal mixture, and explain how you are sort-of-cured, but not quite. Do not start with the allopurinol itch, and explain how your gout would be fixed if only you took the meds every day. Do not hide behind food obsessions, and explain how gout never troubles you if you can only avoid purines. Get a plan, and focus on fixing your gout. Let me help you focus on G.O.U.T. Ⓖ Gather your information. All medical history is important, but nothing more than your uric acid level. There is also a G in diaGnose. Simple:you cannot fix gout if you do not have it. Ⓞ Objectives. Ought to be the most simple, but surprisingly rarely is. If you want to fix gout, your objective is to lower uric acid to 5mg/dL (0.30 mmol/L). That will eventually stop the gout flares and end the gout pain. It will fix your gout, but not if your objective is a short sharp end to gout pain immediately, or if your objective is to confuse yourself with random lifestyle adjustments. The slight complication here is that you may have a choice to make – if the information you Gathered tells you that you that lifestyle could be a factor in your gout, then your Objectives might include dietary and lifestyle adjustments in addition to, or even instead of, uric acid lowering medication. Simple: you cannot fix gout if you do not lower uric acid into the safe zone. ⓊUrate Lowering. Gout leaves uric acid crystals deposited in and around your joints, under your skin, and in various other tissues. You need to get rid of these. The good news is that lowering your uric acid levels will usually allow these crystals to dissolve. The bad news is that it can take time, and you have to be prepared for gout attacks for a few months. Simple: you cannot fix your gout if you give-up before all urate deposits have dissolved. ⓉTend your gout. Unless you have been lucky enough to identify underlying causes of your gout, and got rid of them, you have a lifetime commitment to tend your gout. 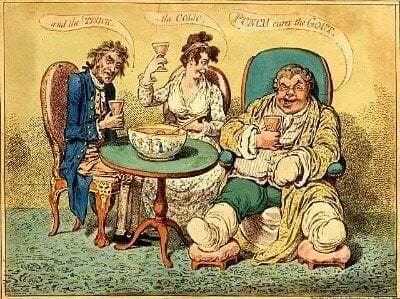 As most gout is hereditary, this probably means you. You must get your uric acid checked at least once every year, and make sure it never (as in never ever) rises above 6mg/dL (0.36mg/dL). 5mg/dL (0.30mmol/L) is the best long-term target to give a safety margin for daily fluctuations. Simple: you cannot fix your gout if you stop monitoring your uric acid levels. So before you ask any questions of your doctor, of yourself, or even in the gout forum, stop to consider what you really want to know. If you do not have a plan to manage gout that follows these 4 simple steps, you will never fix your gout. Worse than that, the lack of context will render your question pointless, and the answer meaningless. If all that seems impossibly simple, or just plain out of reach, do not worry. Over the next few weeks, I will expand on each step so you can easily develop your own plan to fix your ⒼⓄⓊⓉ.